On September 29, ETToday published an article stating the Fubon Guardians plan to send Shen Hao-Wei and an unnamed pitcher to the Australian Baseball League during the offseason. Today, the Sydney Blue Sox announced the signing of outfielder 申皓瑋 (Shen Hao-Wei) and right-handed reliever 羅嘉仁 (Lo Chia-Jen). 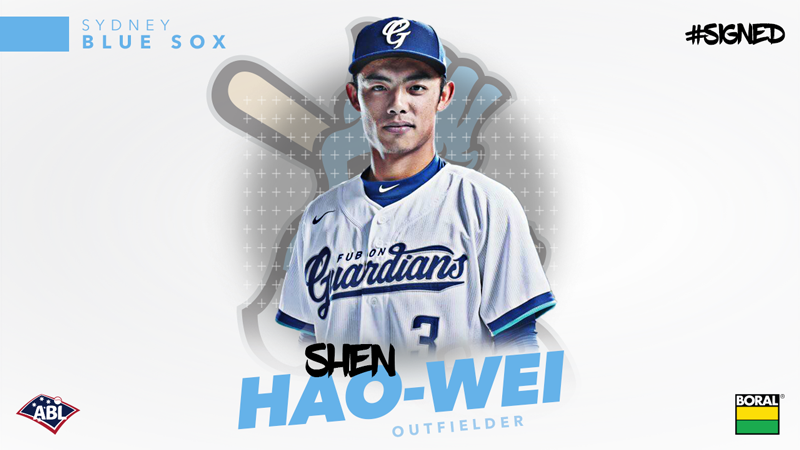 The Sydney Blue Sox have #signed Fubon Guardians @CPBL outfielder Shen Hao-wei for the upcoming season! The 21-year-old outfielder Shen Hao-Wei was the 2016 first round draft pick and signed with the EDA Rhinos for a total package over $205,000 USD. As a rookie, Shen was not given a lot of opportunities in the first team, in 2017 he posted .215/.229/.280 with only 96 plate appearances. In 2018, Shen showed some improvement where he slashed .288/.349/.439 in 152 plate appearances with the Guardians first team. At this stage, his mainly served as a backup outfielder, as he is 5th or 6th in the organisation outfield depth chart. Known for his speed and defensive range, Shen is a highly touted prospect and is expected to be the Guardians’ full-time centre fielders in the next few seasons. The Houston Astros signed Lo Chia-Jen as an international free agent for $250,000 USD in 2008. Lo made his MLB debut in 2013 for the Astros and finished the season with a 4.19 ERA, 1.40 WHIP and 16 strikeouts over 19.1 innings. After six seasons in the United States, Lo returned to Taiwan and entered the CPBL draft in 2014 and was drafted in the first round by the EDA Rhinos. There is a rumour the Uni-Lions are thinking of sending three players to the Adelaide Bite this offseason. Those players are 陳育軒 (Chen Yu-Hsuan), 郭峻偉 (Kuo Chun-Wei) and 蔡奕玄 (Tsai Yi-Hsuan). According to a NZ Herald article, it suggested there will be Taiwanese players on the newly established Auckland Tuatara. “The team was putting together a strong roster for their inaugural season, which will feature local talent as well as players from the United States, Australia, Japan, Korea and Taiwan,” quoted Ryan Flynn from the NZ Herald interview. [Rumour] #UniLions, #Fubon Guardians plan to send players to play in the #ABL. Next articleWang Po-Jung’s Posting Fee: How Much Is Enough for the Monkeys?